In phase II MARVEL will dedicate itself to the core goal of major and ambitious Design and Discovery projects. We have identified six of these, on the basis of their scientific and technological relevance, their collaborative framework, their close integration with experimental synthesis and characterization, their relevance for the Swiss experimental and industrial landscape, their leadership and readiness for deployment, and their breadth or novelty. In addition we propose two Incubator projects — these are the instruments where we nurture the smaller most promising efforts, and engage new investigators and research areas. The first two are dedicated to solid-state ionic conductors and machine learning. A core structural effort is the Open Science platform, powered by our AiiDA materials' informatics infrastructure and Materials Cloud portal for the dissemination of curated and raw data, educational material, open-source tools, user services, archival solutions and FAIR-compliant data management plans. Here, robust turnkey workflows will allow the user community to compute on-demand complex material properties leading the way to providing tailored solutions and Software-as-a-Service, while laying the foundations for a phase III user facility. 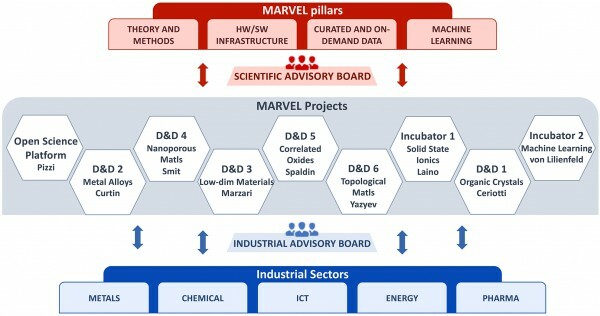 Synergies between projects will be greatly enhanced by such seamless access to data and tools, and MARVEL's contributions to a visionary computing ecosystem powered by the HPC and Future Architectures effort.